A Christening marks the beginning of your child's journey of faith. At a christening your child will be baptised with water. This is the heart of your child’s christening. In the service of baptism parents are able to thank God for the gift of their child and to ask the church for support in nurturing them on their journey of faith.  The priest will pray for your child and for all those who will support them in their path of faith.  A special oil may be used to make the sign of the cross on your child’s forehead. It’s a significant moment, which marks your child as belonging to God.  Water, which is blessed in the church’s font, will be poured over your child’s head by the priest. This is your child’s baptism.  A candle will be given to you in the service when the priest say: ‘Shine as a light in the world to the glory of God’. Baptisms at St. Alban's generally take place on the 3rd Sunday of the month at 12 noon or 2.00pm but can be arranged at other times. 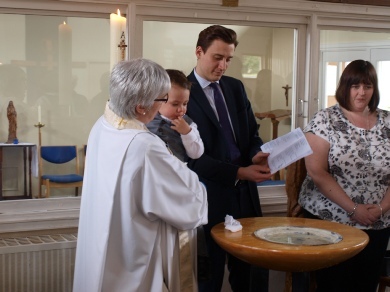 The service lasts about 30 minutes and on some occasions there will be other families also having their children christened/baptised at the same time. To book a baptism you will need to contact the parish priest, who can then talk with you about the baptism of your child and make the necessary arrangements. If you live in the parish of St. Alban’s West Leigh or if you are on the Electoral Roll of the parish then there is no problem with arranging a baptism at St. Alban's. If you live outside the area a letter or email from your own parish priest will be required. Prayer tree at the baptism service with prayers from the people for the child/baby baptised.